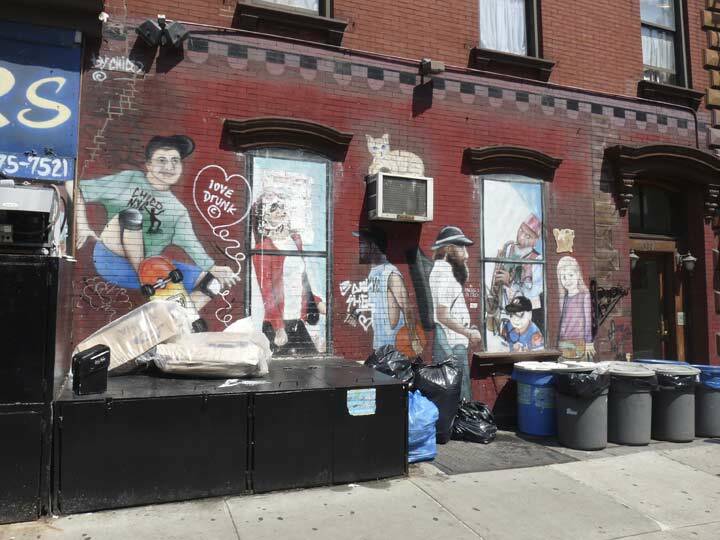 In August I went on a “ramble” from the Canal Street A/C/E subway up through SoHo, Greenwich Village, and the East Side, getting as far as East 59th where I caught the N train to Queens. I’m intending to chop up this walk, for which I got 128 photos, into a number of shorter pages in keeping with my new policy of doing shorter Sunday feature pages—I found those 100+ photo descriptions were getting just a bit tedious. My feature pages tend to be of two separate types: either I’ll describe disparate items all over town with the same theme, or I’ll just walk along one route and describe what I find there. I sort of prefer the former, but during the past few years, the latter has become more dominant, and I place it in STREET SCENES or WALKS, which are now heavily populated; I’ll just have to find more themes. 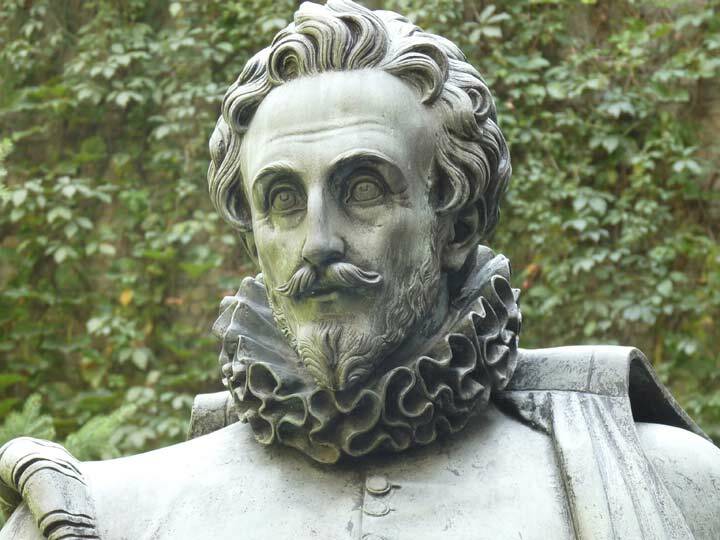 … a statue of one of Spain’s foremost authors, Miguel de Cervantes Saavedra (1547-1616), creator of Don Quixote. 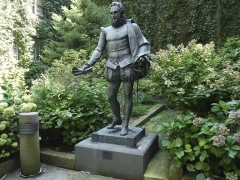 It’s one of the more secluded statues of any famous figure in NYC, located in a courtyard behind several opulent townhouses along Washington Park North; Henry James wrote a novel about one of the families that populated one of the homes in Washington Square which was developed as the feature film The Heiress in 1949. 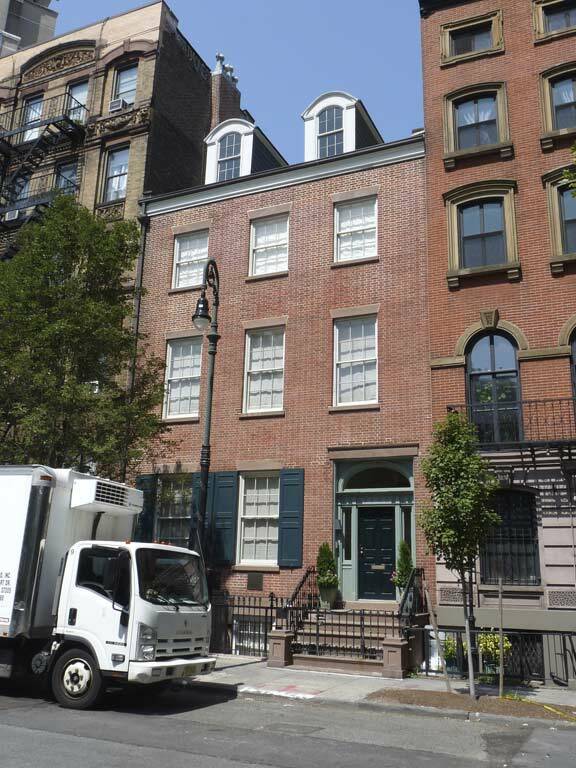 More recently, the house on the corner of WSN and 5th Avenue was the home of the Will Smith character in I Am Legend as he raced to find a cure for the virus that had infected most of humanity, turning them into super-strong, mindless cannibals. 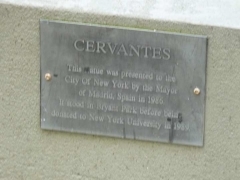 The statue, a reproduction of an 1835 sculpture of Cervantes created by Antonio Solá, was a gift of Madrid mayor Enrique Tierno Galván to the cities of La Paz, Bolivia, Beijing, China, and New York in 1986. 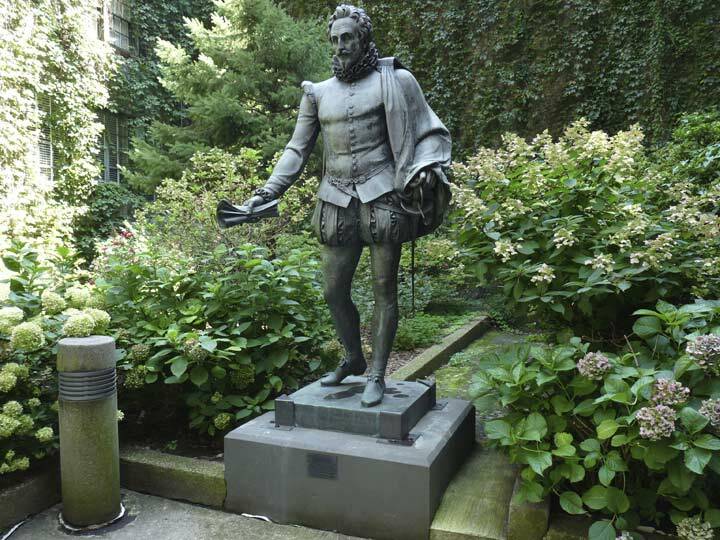 It was originally placed in Bryant Park, joining other personalities in bronze such as editor William Cullen Bryant and industrialist William Earl Dodge. 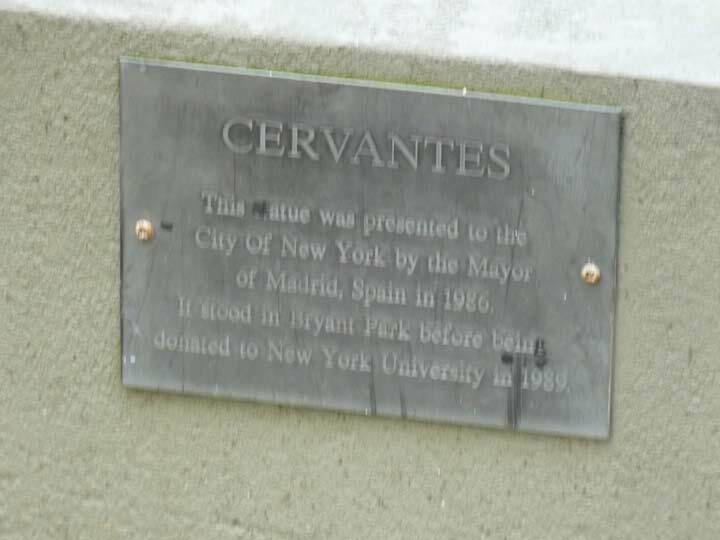 The Cervantes statue was scheduled to be moved to Washington Square Park, but was adjudged too be too fragile, and was donated to NYU, which put it in the courtyard known as “Willy’s Garden” where the proud author stands mostly unnoticed except by NYU students. 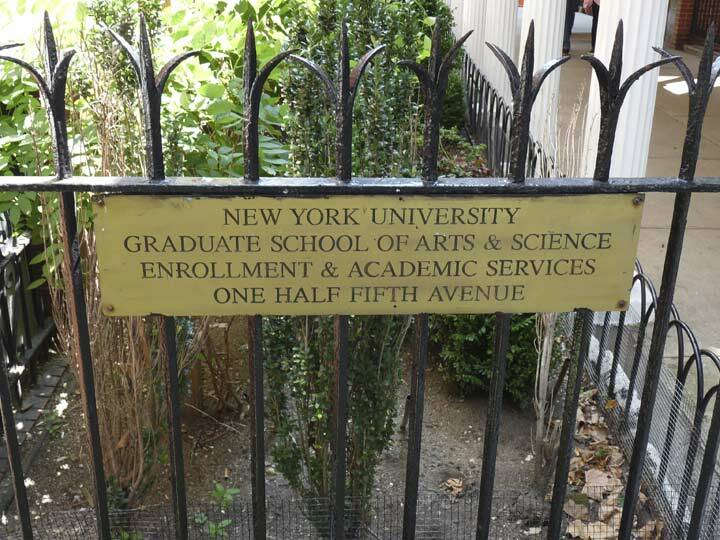 I was unaware before this walk that there was such an address as ½ 5th Avenue. 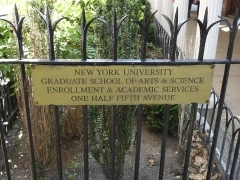 It exists, between Washington Square North and Washington Mews, and is the home of the NYU Graduate School of Arts and Science. The address was likely established after the 27-story tower #1 5th Avenue, constructed in 1927, was built, and the number was taken. 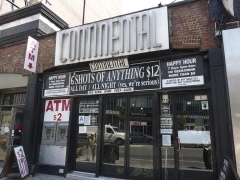 During my college years and after, my friends and I would frequent the bar/restaurant of the same name in the building. I remember a frenzied cab ride downtown to #1 5th from the screening of the original Michael Keaton Batman in 1989. A couple of dates there as well. Its interior turned up in Woody Allen’s Crimes and Misdemeanors. 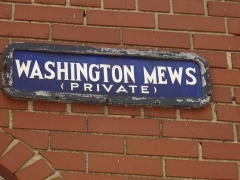 Though there are multiple “mewses” in London, Washington Mews, between 5th Avenue and University Place north of Washington Square North, remains the only street with the designation in NYC. Washington Mews is one of nine separate routes named for George Washington in Manhattan. 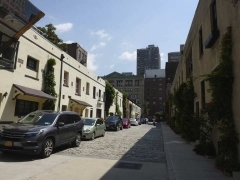 It’s lined with charming two-story cottages that were, at least on the south side, formerly stables used by the well-to-do residents of Washington Square North. It is marked by an old-style serifed street sign. The dwellings on the south side were constructed from 1850-1880 while the ones on the north side, in the 20th Century. 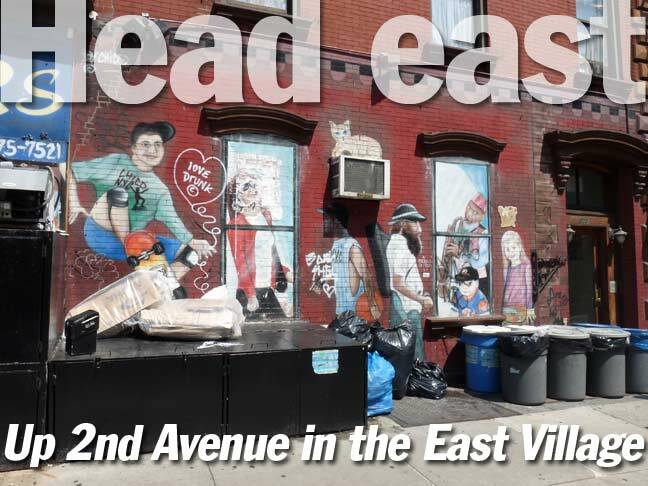 Much more info can be found in the Greenwich Village Landmarked District Report, beginning on page 50. 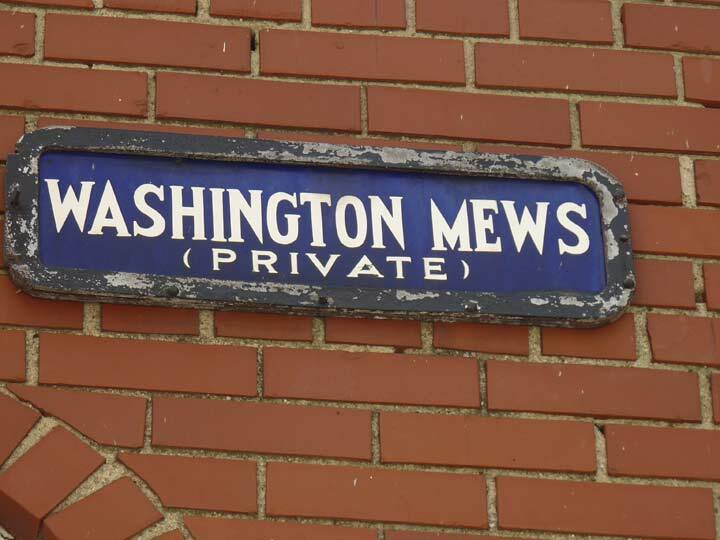 The term “mews” is unusual: it derives from a French word meaning “to moult” and mewses were originally used in the 1300s to place cages confining falcons and hawks used by royalty for sport while they shed their feathers. Only later were the alleys used to house carriages. Since I hadn’t paid much attention to East 9th Street east of 5th Avenue I chose that street to march east. Between 5th and University Place, you find these 3-story brick attached buildings, all with attics at the roofline, likely dating from the mid to late 19th Century. 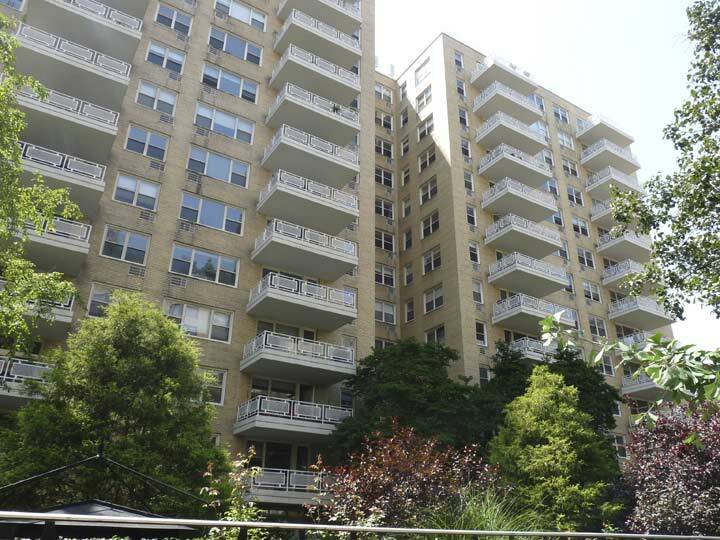 At one time this was the backbone of city residential architecture, later supplanted by brownstones, then squarish brick apartment buildings, and now sleek glass towers. 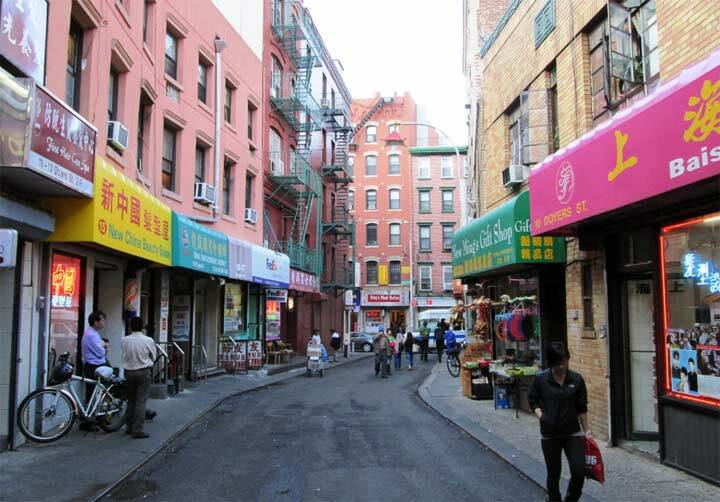 The block of East 9th between University Place and Broadway is a different story as it’s dominated by massive dwellings constructed in various decades on both is north and south sides. 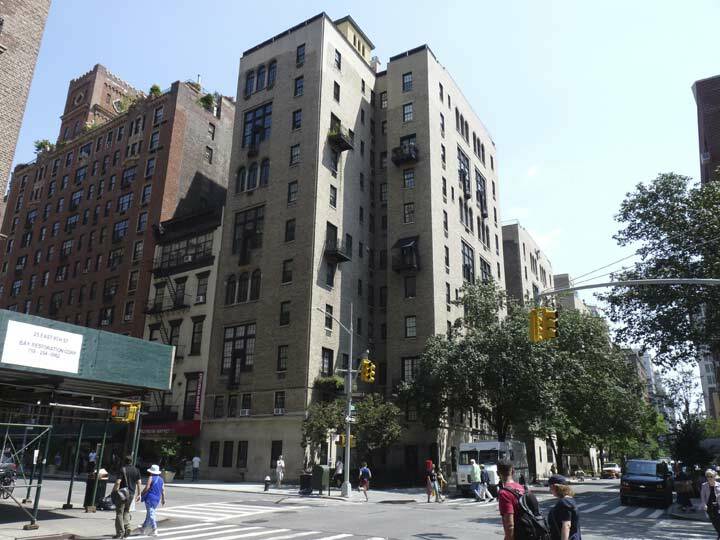 On the corner is #29 East 9th, which is accompanied by its brothers, #35 and #45, massive 11-story apartment buildings from the mid-1920s. On the south side of East 9th are a trio of towers, the Brevoort East at #40, shown here, and #30 and #60, and The Hamilton and The Lafayette. 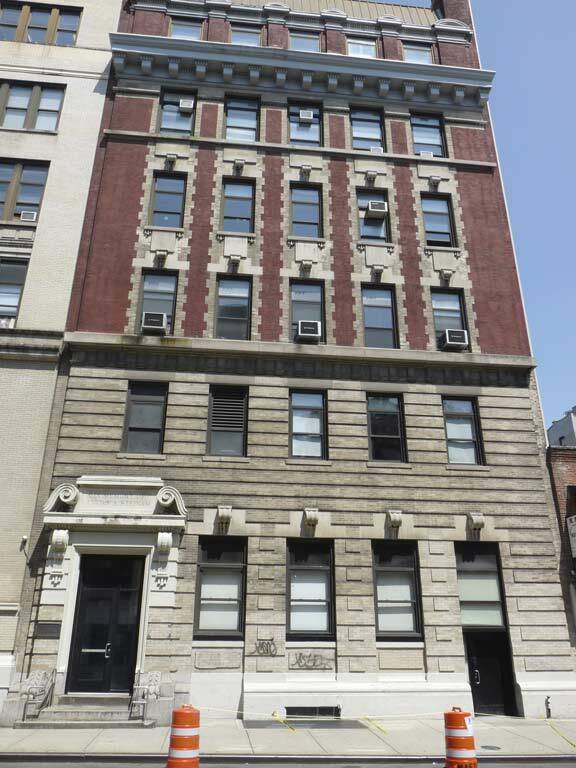 Impresario Joseph Papp (1921-1991) of the NYC Shakespeare Festival and the Public Theater on Lafayette Street, resided at #40 from 1973 until his death. 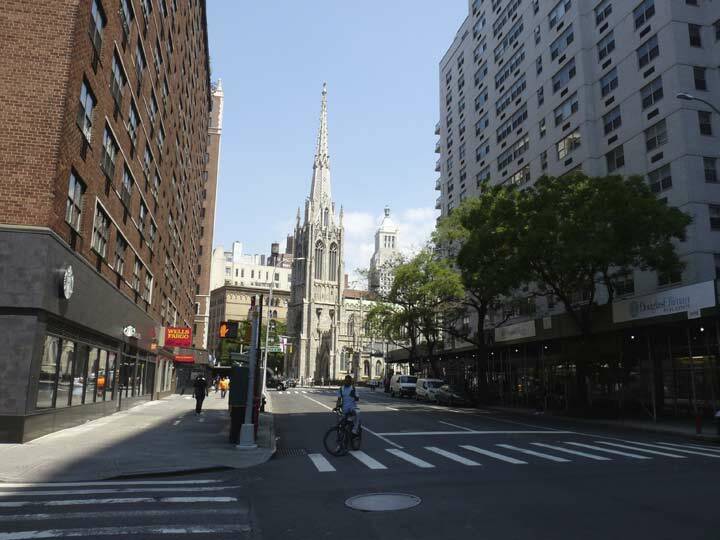 Grace Church, at Broadway and East 10th, is visible when you are looking north on Broadway because of a bend in the road caused by the intransigence of one man: Henry Brevoort, who owned an orchard and refused to budge when the streets were being routed through according to the Randel Plan in the early 19th Century. Broadway was diverted northwest, joining the old Bloomingdale and Kingsbridge Roads uptown, and 11th Street never went through from Broadway to the Bowery Road (today’s 4th Avenue). This gave the trustees of Grace Episcopalian Church, which had been instituted in 1808, a chance to move uptown from the Wall Street area in 1846 on land purchased from Brevoort and build a massive Gothic Revival church building at Broadway and 10th, with James Renwick Jr. the architect at only 23 years of age. Renwick would go on to build St. Patrick’s Cathedral, but many say this is his greatest achievement. Like the Cathedral of St. John the Divine on 110th Street and Amsterdam, Grace Church is never really finished and has been constantly added to over the year. The garden on church grounds at Broadway and 10th was once the site of Fleischmann’s Vienna Model Bakery, the Applebee’s of the mid-19th Century. Here’s a menu. 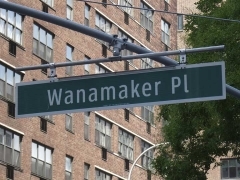 A short section of East 9th Street between Broadway and Cooper Square is named for John Wanamaker (1838-1922), a Philadelphian who co-founded a men’s clothing store in 1861 and with it, the principles of one set price and full-cost returns, revolutionary at the time. In 1875 he purchased an abandoned rail depot and turned it into a department store, heavily promoting it during the Centennial celebrations in 1876. By 1896 Wanamaker was ready to expand into NYC and purchased a building on Broadway and West 9th that had formerly been part of the A.T. Stewart retail empire, and constructed an annex one block south (seen on the right side of the photo in the Gallery above). The former John Wanamaker Department Store Annex is one of the few NYC buildings that takes up an entire square block (Macy’s doesn’t). The main store was a block to the north and was demolished decades ago. 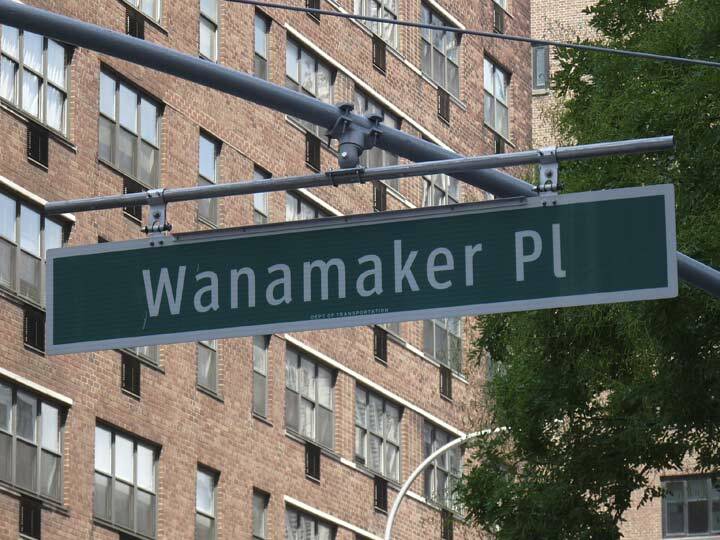 It was Wanamaker who demolished five units of Colonnade Row to make way for a truck warehouse, which still has his name on it. The Astor Place subway station still contains an entrance to the store — now a K-Mart (formerly Kresge’s) on the ground floor. 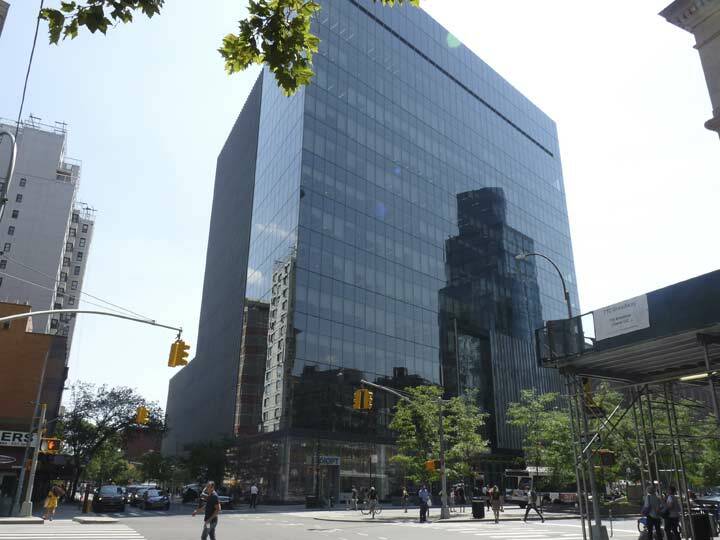 The impenetrable, inscrutable glass tower, 51 Astor Place, resides on the NE corner of Cooper Square and Astor Place. It went up in 2013 and was designed by architect Fumihiko Maki. It took $300M to build; the main tenant is IBM, with St. John’s University also occupying some space. The lot was once home to the 1853 American Bible Society building, which was replaced by a nondescript Cooper Union engineering lecture hall and classroom building that was of interest for me because I heard such lecturers as mapmaker John Tauranac and tour guide Justin Ferate, who “borrowed” some of my photos for my lecture. Those same photos were later used by Ferate when he compiled the NYC Sightseers Guide License test. For all I know the photos are still on the test! On the left, the 1859 Cooper Union school continues to lord it at Astor Place and Cooper Square. 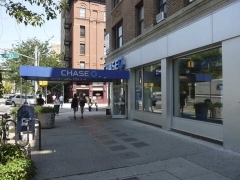 Inventor and industrialist Peter Cooper acquired land here early in his career, after running a grocery on nearby Stuyvesant Street. When the time had come to found this institution, he deliberately placed it at this crossroads to mediate class divisions; even in the mid-19th Century, Broadway and the Bowery were on different levels. The “Union” in the name comes from the important junction of roads, but also the union of art and science and the Union of states, in the late 1850s beginning to sunder by the questions of abolition and states’ rights. A major early coup was Abraham Lincoln’s appearance here in early 1860, kicking off his presidential campaign. (According to legend, after the speech Lincoln repaired to McSorley’s Ale House on East 7th, if indeed it was there at the time; whether he had the light or the dark was unrecorded.) The first great Cooper Union speaker was Mark Twain, as he gave the building’s kickoff lecture in 1859. Every US president followed Lincoln’s suit until Woodrow Wilson. One thing has always perplexed me. Roads that turn into 3rd and 4th Avenues begin at a V from the Bowery at East 5th Street, but both avenues are called “Cooper Square” until they gain their 3rd and 4th Avenue identities north of Astor Place. At one point, both “legs” of Cooper Square were simply called 3rd and 4th Avenues, but I don’t know when the switch was made. 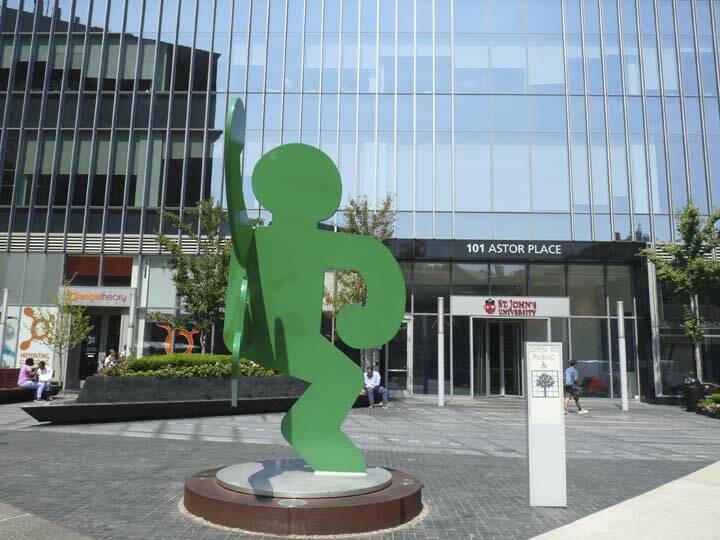 About the only splash of color, providing relief from the monolithic 51 Astor is Keith Haring’s 1986 “Self-Portrait” at Astor and Lafayette. It joins a Jeff Koons balloon rabbit in the lobby, so I am told. This group of buildings on the NE corner of 3rd Avenue and St. Mark’s Place have a date with the wrecker’s ball. 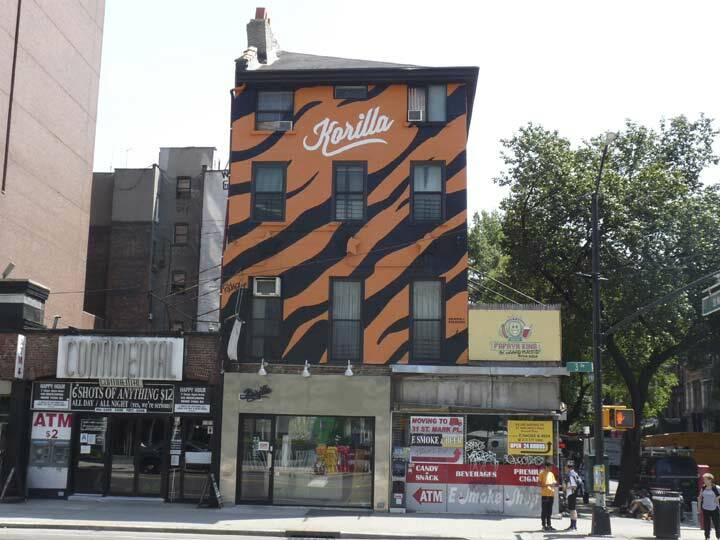 The tiger striping has been there for a few years now, but the restaurant that put them there, Korilla Korean BBQ, vacated in June 2018. 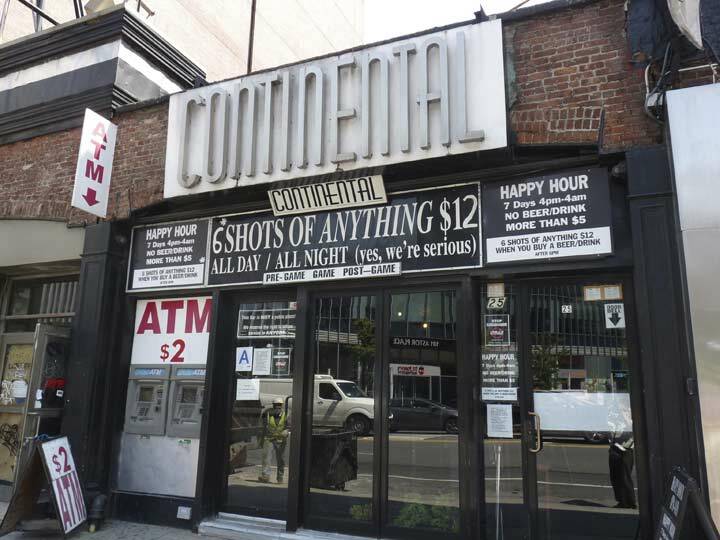 The Continental began as a rock club—acts performing there included The Ramones—but for the last few years it’s been a place to get the 6 shots-for-$12 specials and wasted. 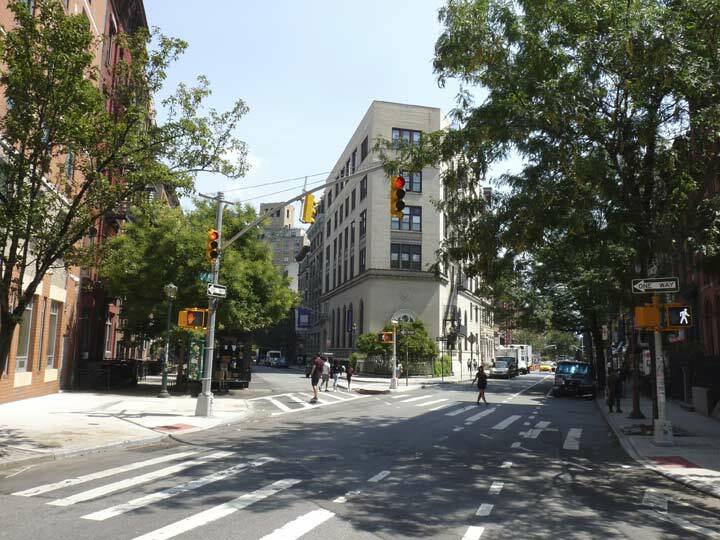 The “X” formed by East 9th and Stuyvesant Street was formerly fairly sleepy, but it’s now busy enough to rate the full stoplights and pedestrian signals treatment. 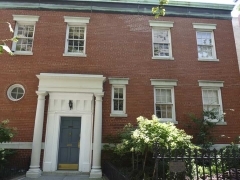 Nicholas Fish-Elizabeth Stuyvesant House, 21 Stuyvesant. 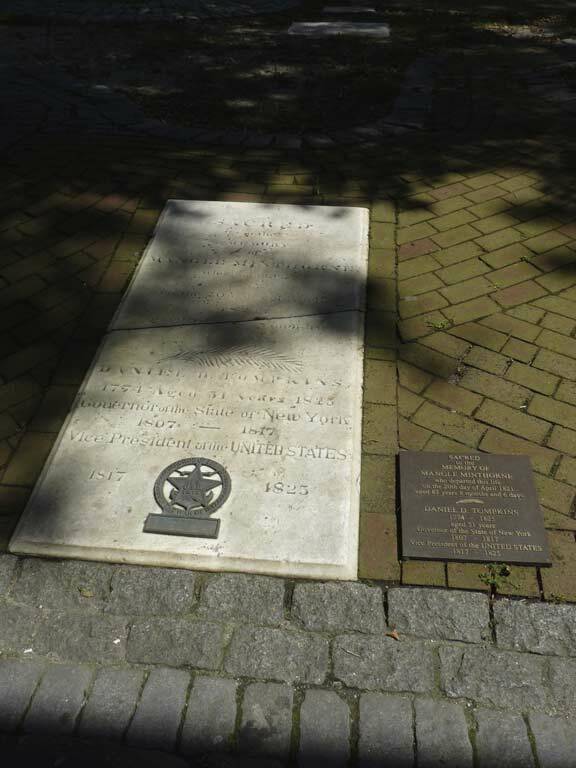 As the historic plaque explains, it was constructed in 1804 by Petrus Stuyvesant as a gift for his daughter when she married Revolutionary War hero Nicholas Fish, who served with Washington at Valley Forge and at age 18 is still the youngest Major in US Army history. He was associated with Treasury Secretary Alexander Hamilton and the Marquis de Lafayette, whose military expertise helped win the war. 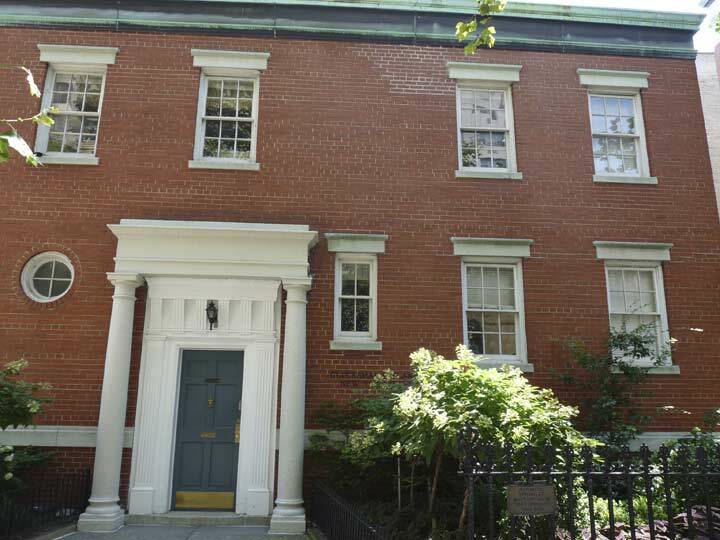 Lafayette visited NYC in 1824 and was entertained in this building. Nicholas and Elizabeth’s son Hamilton was born here in 1808. He went on to serve as US Senator, Governor of NY State, and US Secretary of State under U.S. Grant. The Fish name has long been prominent in NY State politics. 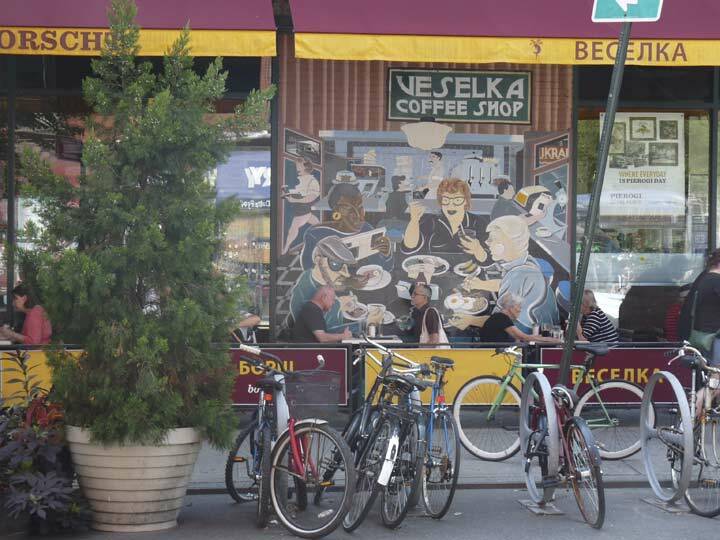 I was attracted to the exterior wall mural at Veselka (“rainbow” in Ukrainian) at 2nd Avenue and East 9th Street. The restaurant was established in 1954 by Ukrainian immigrants Wolodymyr and Olha Darmochawal as a candy store/newsstand and is a reminder that the East Village was once populated by thousands of Eastern European immigrants. It’s known as the pierogi and borscht capital of Manhattan. Since I have never had pierogis, this may be the place to do it. 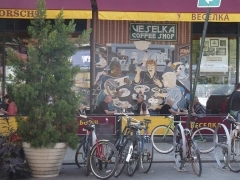 I have been in Veselka only once, about 5-10 years ago. Wall mural on East 9th Street opposite Veselka. 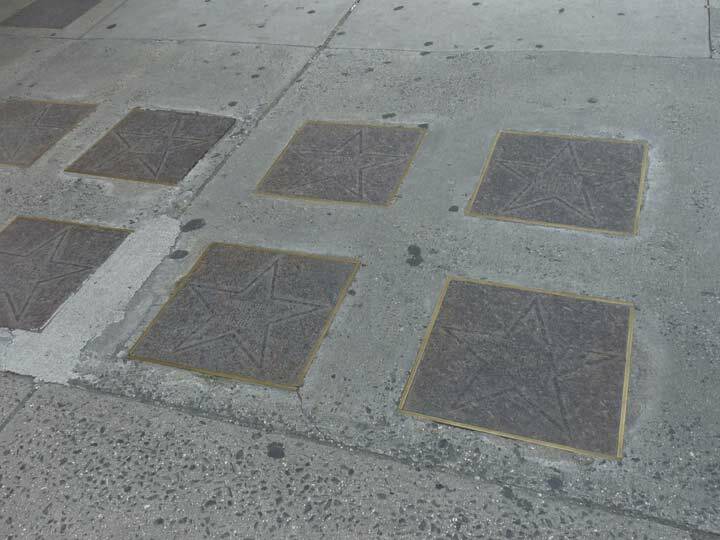 The 2nd Avenue Deli is now elsewhere, but the sidewalk still boasts The Walkway of Yiddish Actors, an homage to the old Jewish Rialto. It was installed in 1984 by deli owner Abe Lebewohl. The names Fyvush Finkel and Molly Picon may be recognizable to American audiences. Fyvush is Yiddish for Philip. 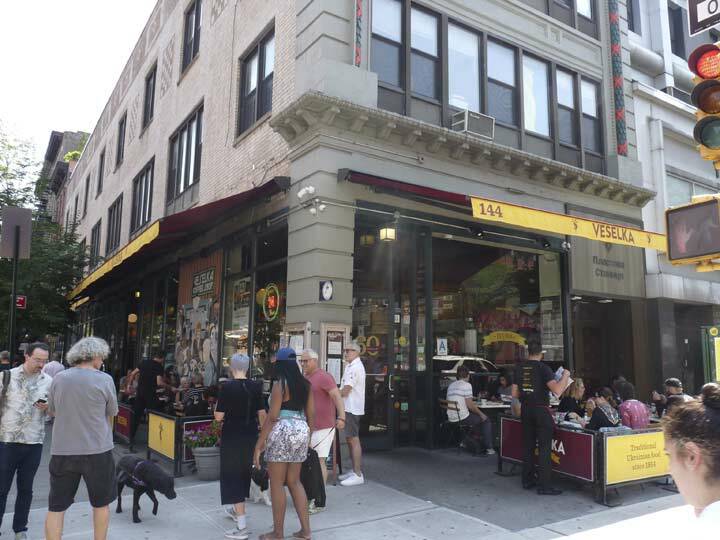 Lebewohl, the longtime owner of the 2nd Avenue Deli (he founded it on the SE corner of 2nd Avenue and East 10th in 1954) was shot and killed in an unsolved robbery on March 4th, 1996. 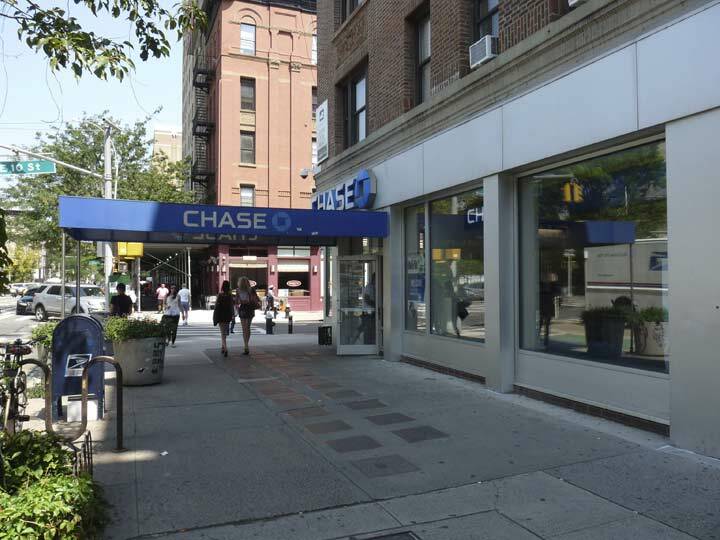 The deli closed at its original location, but later reopened in two Midtown and East Side locations, 162 East 33rd and 1442 1st Avenue. An original 2nd Avenue Deli neon sign can be found at the City Reliquary in Williamsburg. St. Mark’s In The Bowery, at 2nd Avenue and East 10th, is the oldest building on 2nd Avenue, dating to 1799, with additions in 1828 (the steeple) and 1858 (the portico in front). Most of the church had to be rebuilt after a devastating fire in 1978. It stands on the chapel site of Peter Stuyvesant’s 17th Century estate (the Director-General is interred in a vault in the churchyard, as his great-grandson sold the property to the Episcopal Church in 1793) and is turned to face Stuyvesant Street, once the driveway to the estate. St. Mark’s claims to be the oldest site of continuous worship in NYC. 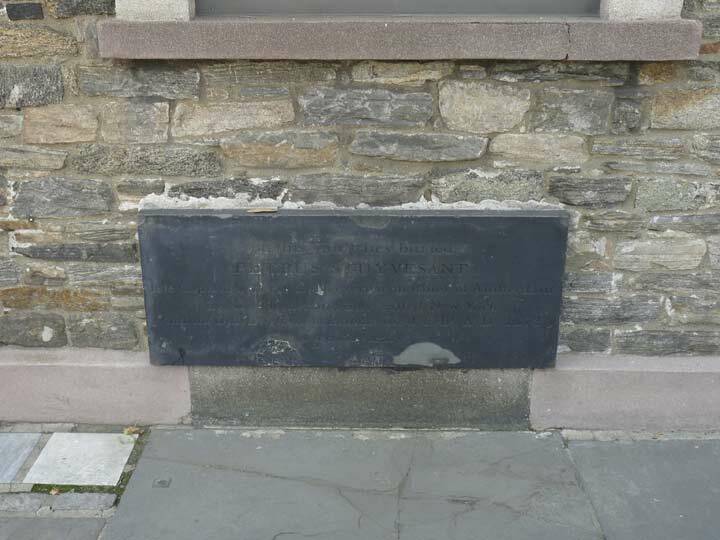 Mayor and diarist Philip Hone and NYS Governor and US Vice President Daniel D. Tompkins are also interred in the churchyard. Peter Stuyvesant’s country house sat roughly at 10th and Stuyvesant Streets, and in his era the Bowery was The Bowery Road, “Bowery’ descended from a Dutch term meaning ‘farm’. The English word ‘bower’ has the same etymology. 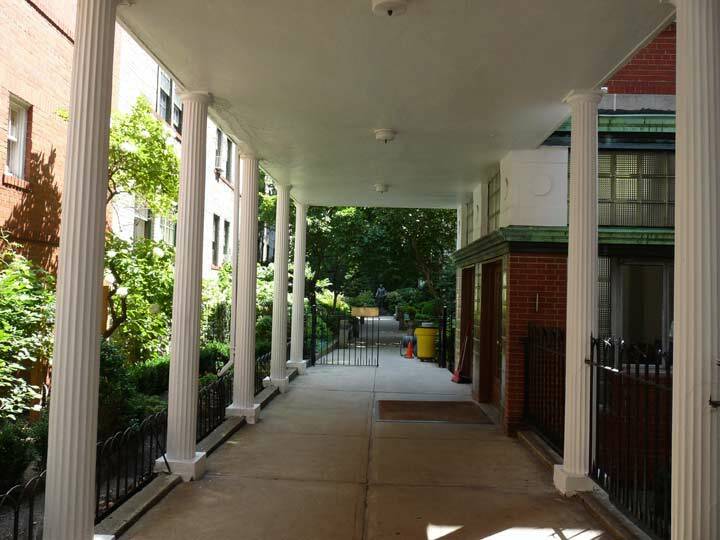 The Stuyvesant estate extended from the Bowery Road east to Avenue C and between about 3rd and 13th Streets. 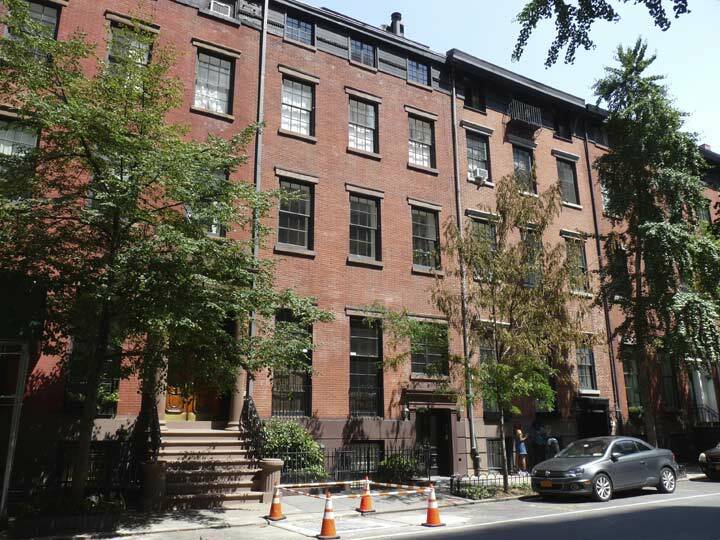 The country house burned down in 1778 but the driveway to that house still exists as Stuyvesant Street, the only street at a diagonal against the street grid in Manhattan except for Broadway from St. Mark’s Place north to Central Park. It is also the only street in Manhattan to run directly west to east. 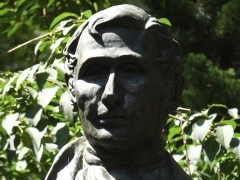 Tompkinsville, Staten Island was founded by a future Vice President, Daniel D. Tompkins (1774-1825) in 1815, while he was the Governor of New York State. He established a ferry service to Manhattan in 1817, possibly from the landing mentioned above at Victory Boulevard, and founded the Richmond Turnpike Company as an expedited means for wagons to travel to Philadelphia and elsewhere on the East Coast; the turnpike, called Arietta Street in Tompkinsville, was renamed Victory Boulevard after World War I. Tompkins was elected Vice President on the ticket with James Monroe in 1816, and served two terms. 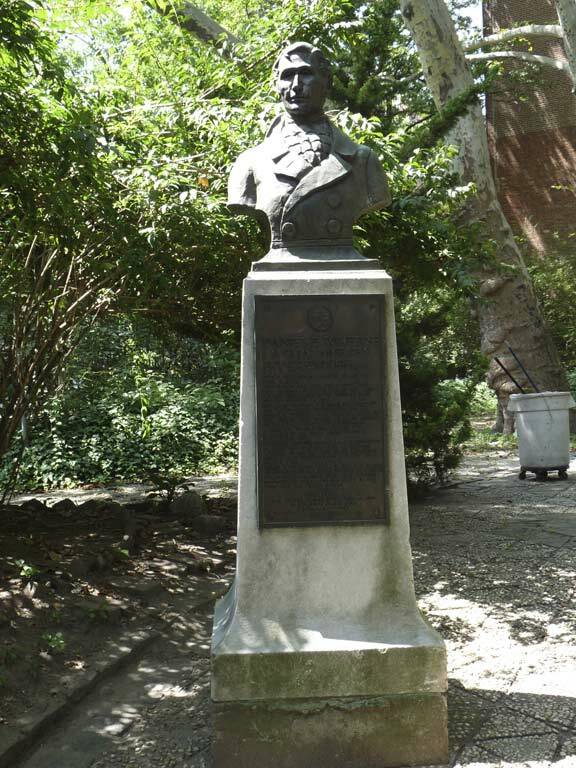 He died in Tompkinsville just 3 months after leaving office and is buried here in St. Mark’s Churchyard; nearby Tompkins Square Park also bears his name, as well as Tompkins Avenues in Staten Island and Bedford-Stuyvesant, Brooklyn. 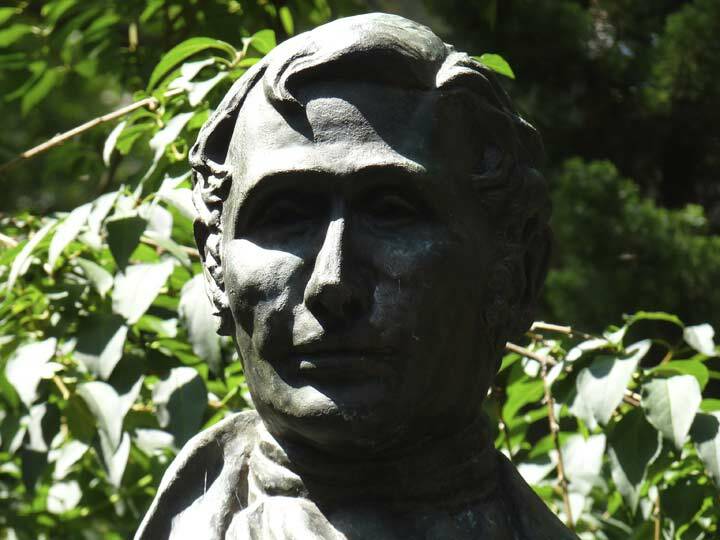 The bust of Daniel Tompkins in the west side of St. Mark’s churchyard was sculpted by Oliver Grymes and given to the church in 1939 by the US Daughters of 1812. 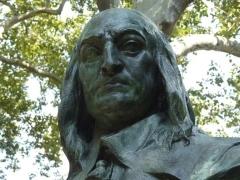 St. Mark’s Church stands on the site of the chapel built in 1660 by Peter Stuyvesant, the last governor of Dutch New Amsterdam, and its grounds are all that remain of Stuyvesant’s vast “bouwerie,” or farm. Stuyvesant was interred in the family vault beneath the chapel when he died in 1672. During the 18th century, the chapel fell into a state of dilapidation, until little remained except the foundation and the Stuyvesant family vault beneath. 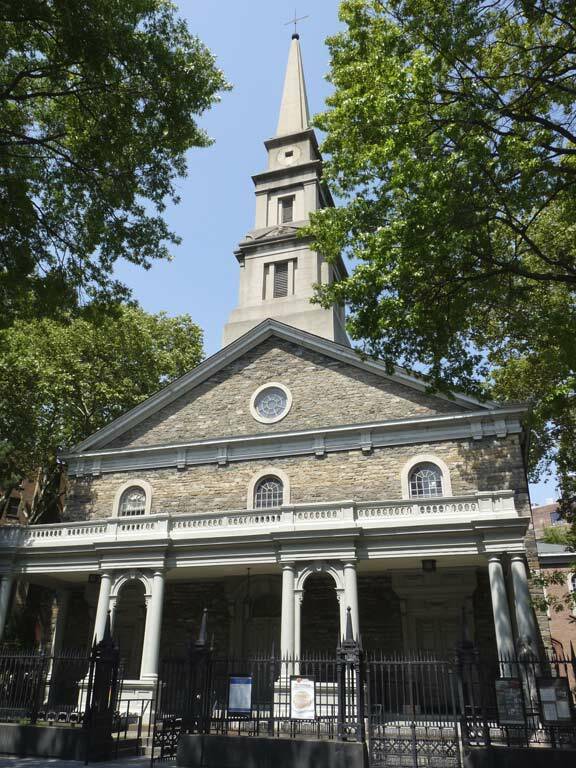 In 1793, Stuyvesant’s great-grandson, Peter Stuyvesant IV, donated the chapel property to the Episcopal Church with the stipulation that a new church be erected. Originally intended to be a chapel of Trinity Parish, St. Mark’s in-the-Bowery was completed in 1799 as the first New York City Episcopal parish separate from Trinity. The Stuyvesant vault is still present under the east wall of the church; it was closed permanently when the last family member was interred there in 1953. 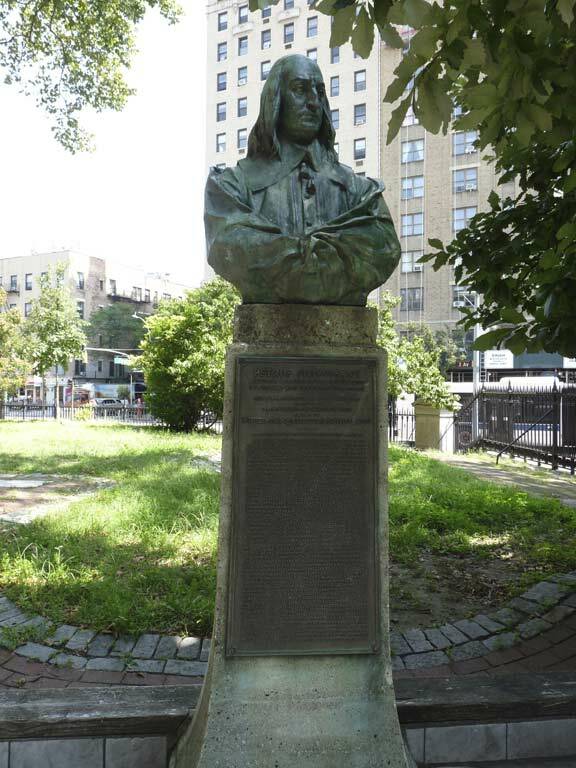 Designed by Dutch sculptor Toon Depuis, the bust of Stuyvesant outside the church was presented to St. Mark’s by Queen Wilhelmina of Holland and the Dutch government on December 5, 1915. A full body statue of Peg Leg Pete is in Stuyvesant Square a few blocks away. St. Mark’s Church has long been a spiritual and cultural center, but also a focal point for social activism. 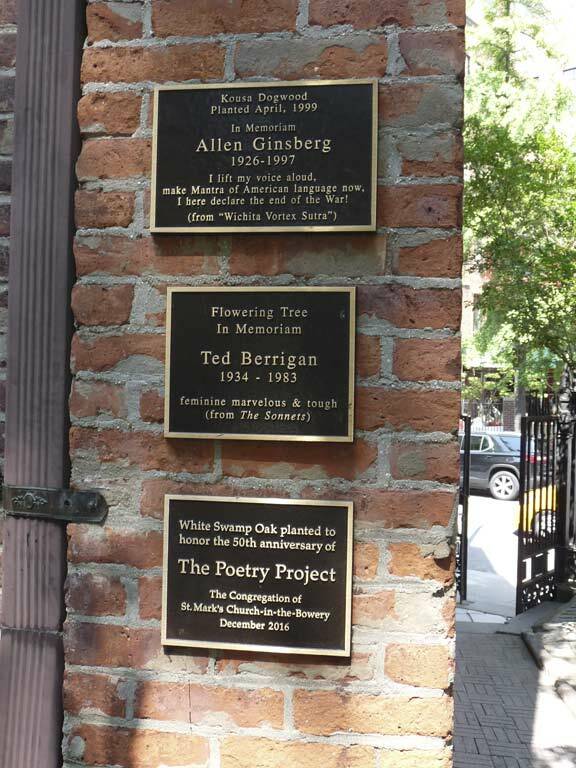 Trees have been planted for the memories of poets Ted Berrigan and Allen Ginsberg. 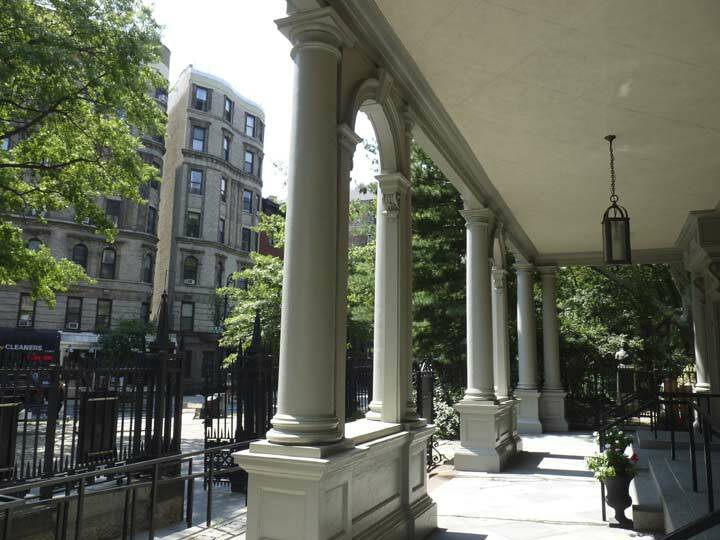 Relaxing on the 1858 St. Mark’s church portico. 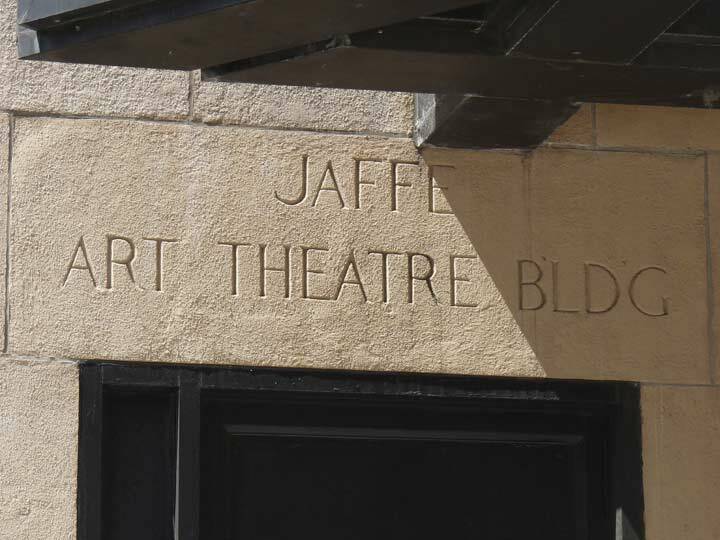 The Village East theater was developed by Louis Jaffe in 1925 as the Yiddish Art Theatre, as part of the many theaters featuring productions in the Yiddish language spoken in Eastern Europe. Composers Ira and George Gershwin got their start here, as well as Broadway and Hollywood’s Paul Muni and Edward G. Robinson. After a turn as the Phoenix Theatre, it was later named for the developer and is now Village East City Cinemas. 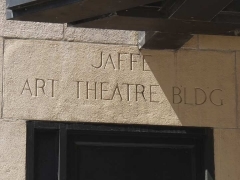 2nd Avenue was known as the “Jewish Rialto: beginning in the late 19th Century, and a number of theaters featuring productions in the Yiddish language could be found here. One other survives: The Orpheum on 2nd Avenue and St. Mark’s Place had opened by 1904 was the “Player’s Theatre”, and was part of the “Jewish Rialto” along Second Avenue. 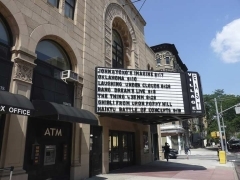 By the 1920s, the theatre was exhibiting films, but was converted back to dramatic use in 1958, with the first production, Little Mary Sunshine, opening in November 1959. Significant productions include the revival and revamping of Cole Porter’s musical Anything Goes in 1962, Little Shop of Horrors in 1982, Sandra Bernhard’s Without You I’m Nothing in 1988 and David Mamet’s Oleanna in 1992. Stomp has been there since 1994. 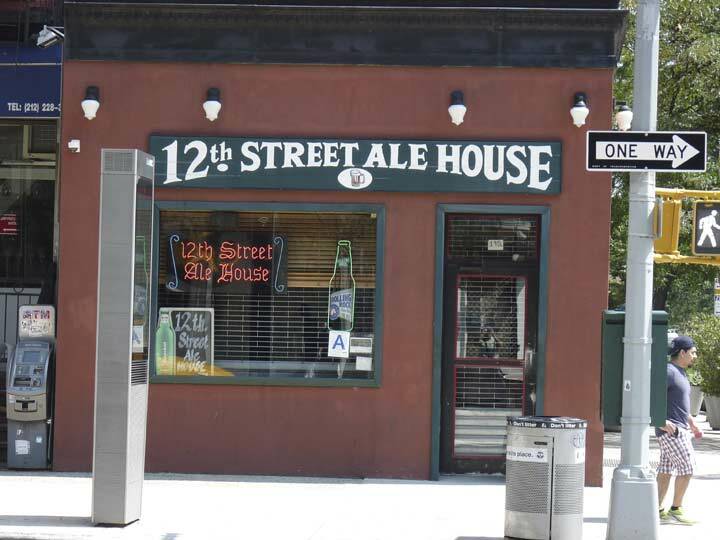 I’ll finish with a look at the 12th Street Ale House, whose green and white sign is reminiscent of McSorley’s old Ale House a few blocks away on East 7th. A glaring typo…”heavily promoting it during the Bicentennial celebrations in 1876.” oops! A relatively little-known fact is that James Monroe, under whom Daniel Tompkins served as Vice President, himself died in Manhattan. Monroe retired to his Virginia plantation after leaving office but five years later in 1830 moved in with his daughter and son-in-law in Manhattan following the death of his wife. He died a year later and was buried in New York Marble Cemetery, though in 1858 his body was moved to a cemetery in Virginia. The Manhattan residence was on Prince Street, but was demolished in the 1920’s. Kevin: In the Wanamaker paragraph, of course you meant Centennial Celebration, not Bicentennial, as 1876 was 100 years since July 4, 1776. Also, as a proud Cooper Union Engineering School graduate (Class of ’74) who attended many a lecture at the ‘nondescript’ 51 Astor Place building, I greatly enjoyed the references to my esteemed alma mater. 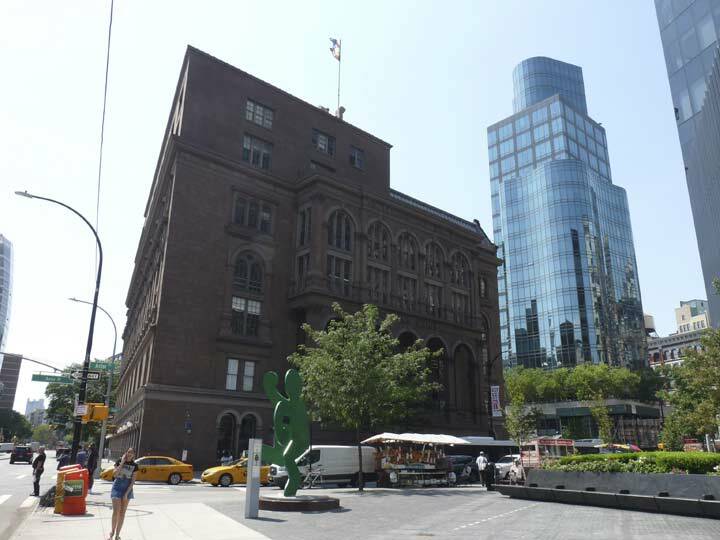 Finally, one piece of Cooper Union trivia: A key scene of the original (1974) film The Taking of Pelham 1-2-3 was filmed right next to this building, across from the ‘Cube’ sculpture and the Astor Place subway kiosk entrance. I know this because I was there with several fellow classmates to witness the filming, which necessitated the Police closing of several nearby streets, took several hours, and required more than one take. Wanamaker’s never moved uptown and just gave up and closed their store in the 50’s..However, they did keep a small presence in lower Manhattan on Broadway near Wall Street lasting a few years..My Uncle used to buy their Men’s business shirts there…..
Ah, this brings back a lot of memories. 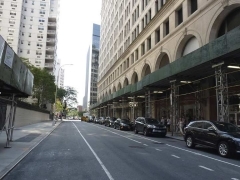 I worked at 770 B’Way for nine years (that’s the old Wanamaker Annex building, which keeps a Broadway address even though the office entrance is on 9th) and always loved this area of Manhattan. Always a lot of places to eat, and Washington Square Park was a short walk away. Sad to see the buildings at Ninth and Third finally coming down. Around the corner from Korilla was an outpost of Papaya King, and it was always great to go there and get a cheap lunch on some of the best dogs you could find in the city. I don’t miss working in the city, but I do miss being down in that area every day. Sorry, but I don’t think Mark Twain opened the Cooper Union in 1859!